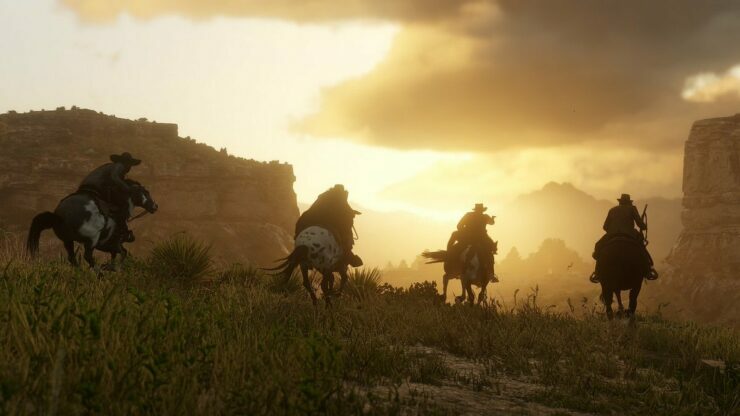 Rockstar took a lot of time developing Red Dead Redemption 2 and all its many underlying systems. One that’s been significantly enhanced is the interaction with horses of our protagonist. In an interview with EDGE magazine (December 2018, issue 325) Art Director Aaron Garbut detailed just how much work went into this particular aspect of RDR2. Like many parts of the game, the team iterated on the horse for years. The personality of the horse will come through in its behavior, reacting to the world in a way that’s unique to its breed and your bond with it. Your horse should feel like a living creature with a mind of its own, and we spent a lot of time tagging elements of the world so the horse knows where it wants to go, and what it wants to avoid, as much as the player. Beyond that, though, we want the horse to feel like a companion. You start to care for it, and it upsets you when it’s hurt. Looking after it, and bonding with it, becomes something you want to do not just for the benefits it can bring but because it’s your most trusted friend. If it’s hurt and dying, you have limited time to get it medicine, and it’s at times like these that the game opens up its own adventures. Suddenly nothing matters as much as helping your horse. That said, you could just let it die and get another. Well, I couldn’t. Maybe you could. Rockstar also boasts to have created a much more dynamic and lively world. Garbut explained that the studio left behind the tired open world tropes to create something different entirely. A big difference for this game is making sure that the player’s not just discovering fun things to do, but that the world is constantly serving things up to you in subtle ways. A rattlesnake spooking your horse, animals lurking in the woods, a rival gang’s campfire off in the distance, the distant lights of the nearest town – there’s always something going on. The things that happen to you as you simply hang out in the world pull you through it, creating rewarding experiences in their own right. That feels real, and it feels new. We have moved away from typical open-world tropes. This is not a collection of missions inside a big world filled with blips for pick-ups and minigames. It’s much more subtle, and much more real. We don’t think of it as a game to be played through. It’s a place for you to get lost in. We won’t have to wait long to verify the bold claims made by Rockstar, as Red Dead Redemption 2 is out in exactly two weeks from now on PlayStation 4 and Xbox One.